The first day of Fall is September 22nd. Fall brings cold weather, colorful leaves, holidays and so much more. 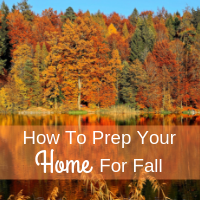 The transition to a new season is a good time to do some maintenance on your home before it gets too cold and to prevent anything from breaking that could be more costly later on. With these tips your home will be prepared for any cold weather. 1. Tackle The Gutters - You may have to do this a couple of times in September and October as the leaves are continually falling, however, this simple act can prevent bigger problems later on. 2. Roof Check - Do a visual inspection of your roof either by climbing up with a ladder or using binoculars. Look for anything missing or damaged. 3. Clean the Chimney And Fireplace - Hire a service to clean and inspect your chimney and fireplace or do it yourself. This means you won’t have to worry about your fireplace not working correctly in those cold months. 4. The Windows - Check the caulk and weather stripping around your windows to ensure you aren’t letting in unnecessary cold air. It’s also a good time to wash your windows and screens so that you can let in as much light as possible in the winter. 5. Check Your Furnace - If your furnace hasn’t been professionally serviced for a while now would be a good time to do so. It’s also a good idea to regularly replace the filter to prevent any other parts from breaking. 6. Organize The Garage - Fall is a great time to organize your garage. The weather is nice and you’ll be needing the extra room in your garage to store your summer items. 7. Water Spouts, Sprinklers & Hoses - A frozen pipe in the winter is stressful and costly. It’s important to put away your hose every winter by winding it up and storing it in your garage or shed and off of the floor to ensure its longevity. Shut down your sprinkler system and outside faucets as soon as your finish your final lawn trims outside. Once you are finished prepping your home for Fall you can sit back, relax and enjoy all things that come with this new season.